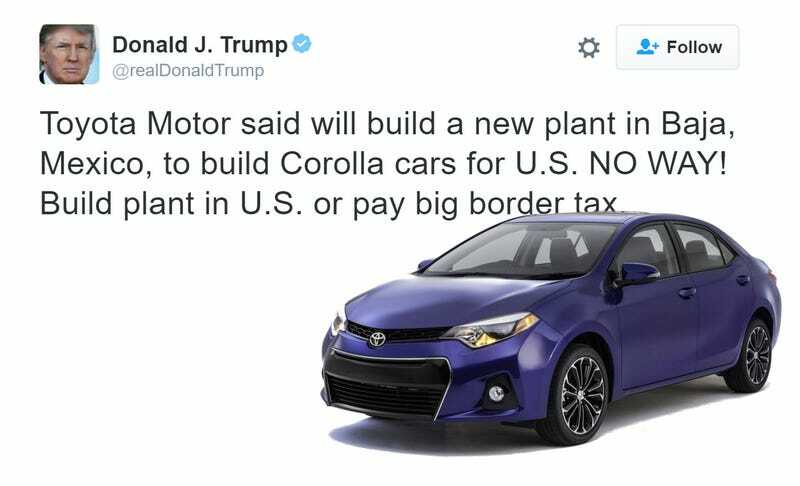 Donald Trump is angry on Twitter at an automaker again, calling out Toyota earlier today for building a new plant in “Baja, Mexico” to manufacture the Corolla sedan. He probably meant the new plant actually being built in Guanajuato, Mexico. We briefly touched on President-elect Trump’s Toyota tweet earlier today while expressing concerns over his willingness to interfere with the free market system, wielding his not-yet-official power to have major effects on, specifically, the automotive industry. The factual issue with the tweet in question is that, while Toyota does have an existing plant in Baja, Mexico, the new plant it began constructing in November for future Corolla production is actually located in Guanajuato, Mexico, as The Guardian pointed out. Before being directly confronted by the President-elect today, Toyota President Akio Toyoda said the company would wait until after Trump’s inauguration on January 20th to make any decisions. After the tweet, a spokesperson said the automaker was looking forward to “collaborating with the Trump administration to serve in the best interests of consumers and the automotive industry,” via Reuters. Of course this isn’t the first time the President-elect has threatened major automakers with a border tax on Twitter, with multiple attacks against Ford throughout his campaign and the election process, as well as General Motors two days ago where he wasn’t entirely correct either. His tweets may be having an effect, as Ford has now reversed plans to shift its small car production to Mexico, cancelling a $1.6 billion Mexico plant for a $700 million investment in Michigan for its electric vehicle development. Ford CEO Mark Fields stressed in an interview with CNN that the decision was independent from Trump’s attacks on his company. Either way, if Donald Trump is going to use his Twitter account to try and influence industries, politics and the rest of the world, perhaps he should get a quick fact-check before publishing. Even Trump’s upcoming press secretary admits he doesn’t “get a memo” before Trump tweets. Accuracy must not be a priority. Guanajuato really eats up those 140 characters, though.